We reported yesterday that AT&T had listed both the black and cyan Lumia 900's as backordered on their site and it was increasingly harder to find them in the stores (though we have heard that certain stores still have stock). However, we were a bit cautious to suggest that it was because the Lumias were selling out due to popularity. After all there was a good chance stock was being pulled to be re-flashed with the new firmware to fix those data-connection issues. While we're still not prepared to call the Lumia 900 a best-seller without firm numbers, there is seemingly more good news. On Amazon Wireless, the matte-black Lumia 900 has been holding the #1 spot under "AT&T phones with contracts" for one week now with the cyan variant close behind at number two. Just as impressive, the matte-black Lumia 900 has the #1 spot across all carriers. Yowza. What's more, the cyan version is now listed as back-ordered although the matte-black is listed as still available. That tells us a couple of things: the backorder business probably really is due to stock shortage and not just phones being pulled for re-flashing of firmware, otherwise we'd expect the matte black variant to also become back-ordered. 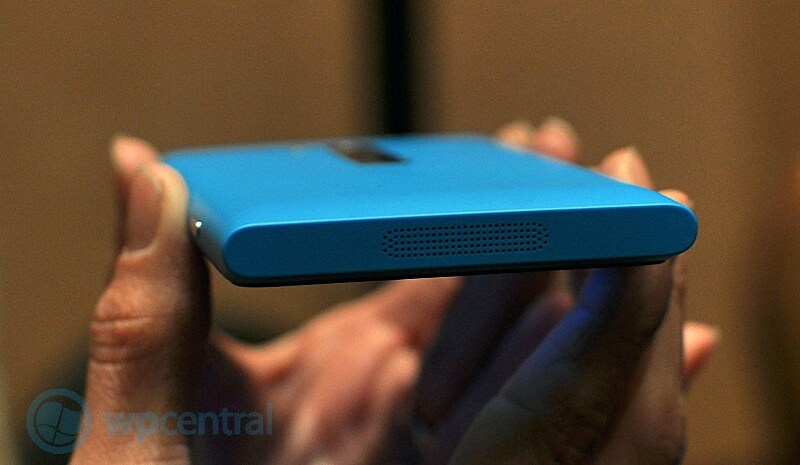 The second is that the cyan version most likely has less stock available as compared to the matte-black. The cyan version has constantly trailed matte-black in the number two spot (and lower) over the last few days but it's the one listed as backordered. That's probably not too surprising as the color choices of the Lumias have always caused delays (and last we heard the glossy-white Lumia 900 was an in-store purchase only, it will be curious to see if that holds next Sunday when it is released). 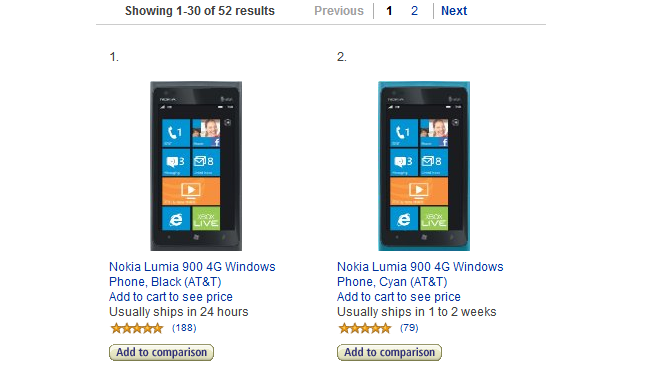 Either way, it at least looks good that the Lumia 900 has been number #1 and #2 on Amazon Wireless for one week. Those stats are updated hourly, not daily, which means it's a fairly good indicator of popularity. Backorder status, while frustrating, only adds to that perception (though for all we know, Nokia only had limited stock anyway). With both phones holding 5 out of 5 stars from 250 reviews, user-satisfaction seems extraordinarily high as there's not a single device in the top ten that has those stats. Even the Samsung Galaxy S II Skyrocket (4G LTE version) is sitting at #7 (black) and #23 (white) which is fascinating for such a popular line of Android phones. Sadly, the much-overlooked HTC Titan II, a phone which we love here at WPCentral, is sitting at a lowly #26. An obvious casualty of the Nokia-AT&T media saturation of the Lumia 900.